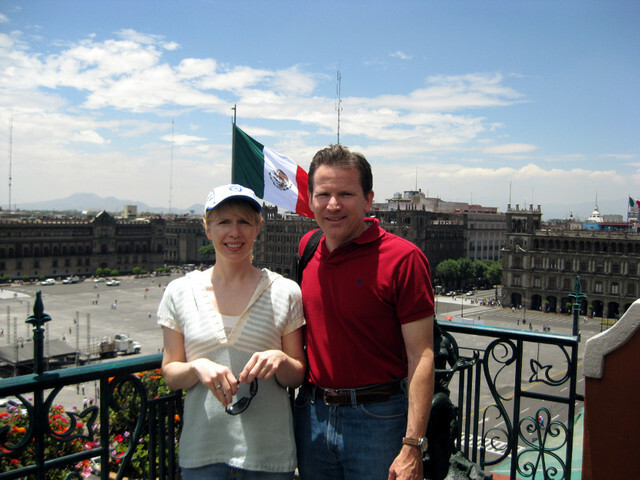 Last week, my wife and law partner, Andrea Lamere, and I were in Mexico City for seven days. Follow the continuation below if you're interested in reading a duplicate of the first report I wrote and posted on the (private) weblog I share with my extended family. (Photos, too. 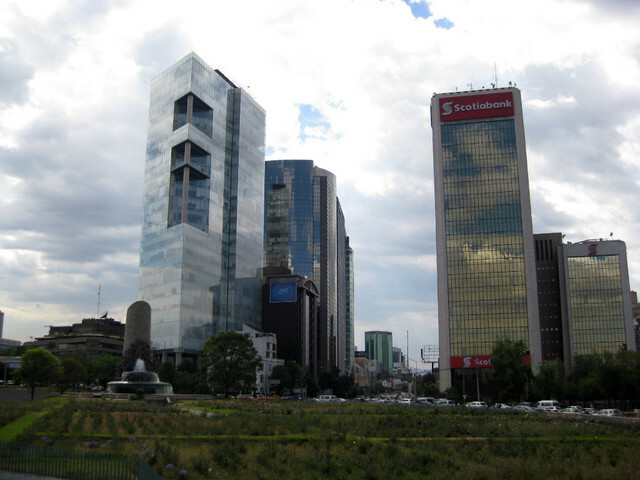 I also took a trip to Mexico City last year with my daughter Lydia; photos and post here). So far, we've seen the historic downtown district and a neighborhood called Polanco where the rich residents of Mexico City shop. In Polanco, we walked through Lincoln Park (that's Abe Lincoln) and ate some ice cream. That was on Tuesday. Today, on Wednesday, we had a driver and guide named Ricardo. Ricardo is a friend of our friends in St. Louis who are originally from Columbia (the country) but are now living in the United States. We didn't meet Ricardo until today, although I (Evan) set up our meeting on the telephone from St. Louis -- in Spanish. Ricardo only speaks a little English, though he is a self-employed engineer who has taken courses in Florida and Chicago. All the communicating today was in Spanish, with translations for Andrea. Bought bus tickets to go to Puebla tomorrow (without Ricardo) -- the fourth largest city in Mexico that is famous for its pottery. It's two hours away by bus. The first class bus ticket cost only $25 per person round trip. Drove south to UNAM, the National Autonomous University of Mexico. It was founded in 1551 and is the largest university in Latin America -- about 280,000 students. It was hard to find a parking space, but Ricardo haggled for one, and we walked around and went to one of the bookstores -- a bookstore that sells books published by the university press. I bought a book about American politics and the challenges for the 21st century from a Mexican perspective. Toured the house that Frida Kahlo shared with Diego Rivera. There is a museum there now. 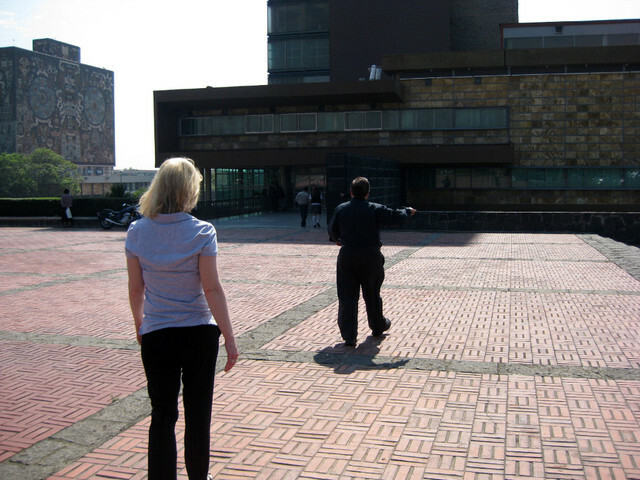 Here we are at the university -- Ricardo is leading the way in the dark clothing in front of Andrea. Next time we come to Mexico City, we're invited to his house for dinner. One more story. When we returned to our hotel today, the Four Seasons, there were metal detectors set up to get back inside. We asked why, of course. We were told that the President Calderon, the Mexican president, was going to be speaking at an event a little later. When we went down to the hotel bar later in the evening, the metal detectors were gone -- the event must have gone off okay. Eso es todo . . . That's all for now.